A Wedding Scene Straight from the Comics! A few days back, the Internet was abuzz with the wedding of Sir Patrick Stewart to his girlfriend, Sunny Ozell. For comic book and sci-fi fans, you would know that Patrick Stewart was the stalwart star of the legendary Star Trek series, and in more recent years, played Professor Charles Xavier in the X-Men movie franchise. 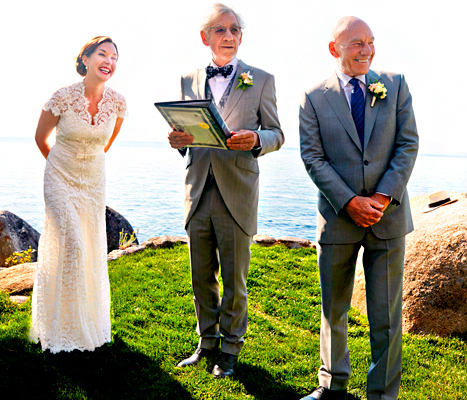 In the one and only public photo of their wedding ceremony at Lake Tahoe, you can spot another celebrity in their midst; Sir Ian Mckellen, who coincidentally plays the antagonist Magneto in the same X-Men franchise! Just throw in a huge British mansion in the background, and you’ve got a scene from the X-Men, right there! The lovely bride is wearing a French lace piece by English designer Temperley London, while the two gentlemen look amazingly dapper in their grey suits! Talk about aging well.